Everyone has a theory about the dinosaurs. And by that I mean everyone thinks something different about why they went extinct (Not to be confused with those who think the dinosaurs were alien God creatures that begat Xenu, or those who think fossils we strategically placed on earth by God to test us, or those who think they are dinosaurs). 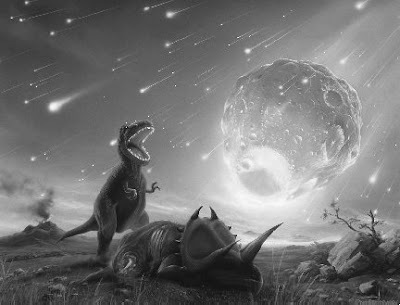 Some say it was a giant meteor, or comet that wiped them out. Others think is was volcanoes. Others think they annihilated each other with nuclear weapons in their own Jurassic World War III. But to these simple-minded theories I say, "No." And, what's more, I said it in quotations. The truth is, dinosaurs were wiped out by robots. Both in actuality, and proverbially. Back when they roamed the earth they had a terminator dinosaur scenario, just like the movie, except John Connor the dinosaur didn't make it. T-1000 the T-Rex, liquid-metal clawed his face off. So that is obviously disheartening, and to make things worse, the consequences are readily apparent today in museums, exhibits, and universal studios: animatronic dinosaurs/secret spies from the prehistoric past. Proverbially speaking, things aren't much better for dinosaurs. 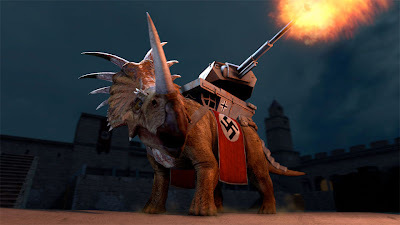 Back in my day, every little kid loved dinosaurs. Children everywhere had plastic dinosaurs, watched "Denver the Last Dinosaur," and thought they were T-Rexes. Some still do. But, unfortunately it seems the heyday of the dinosaur has been taken over by robots. And these robots are the following non-people: Miley Cyrus, Dora the Explorer, and Lady Gaga. So, sad face for dinosaurs. But, on the bright side, at least we now know what happened to them.